New Smartphone, Tablet, Laptop or Desk Top for Christmas? 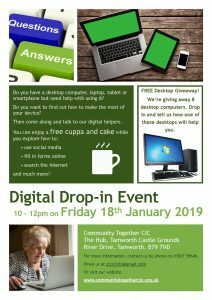 Or just need support with any of those technologies then on Friday 18th January 2019 between 10am to 12pm we are hosting a special event to showcase, and kick start our Digital Support Drop In Sessions for 2019. At the event people will be able to speak to volunteers about any assistance they would require with digital technology from Smartphones, Tablets, Laptops and desk top computers we are here to help. Free refreshments will also be on offer. 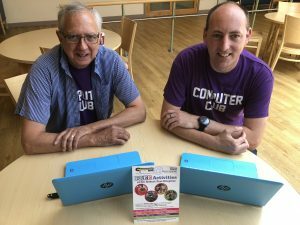 As part of the event Community Together CIC will also be giving away 8 desk top computers for people that either don’t currently have a computer or would benefit from a desk top in their home. People can come along on 18th January and register their interest and why they would benefit from one of the desk tops and 8 people will be chosen. Community Together CIC offer a weekly digital support service from their centre in Tamworth Castle Grounds and at Sir Robert Peel Hospital. 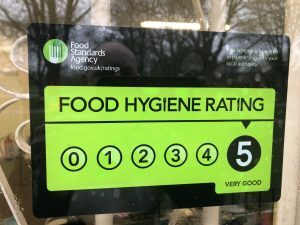 Community Together CIC is celebrating the start of the 2019 with a 5 Star Food Hygiene rating following an inspection before Christmas. 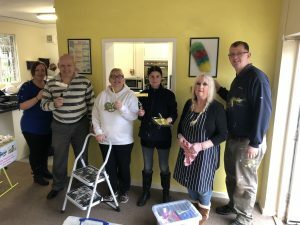 Over the Christmas period Community Together CIC volunteers have been working hard at ‘The hub’ in Tamworth Castle Grounds to get ready for the new year as part of the usual winter deep clean, and they have decorated the centre from top to bottom. 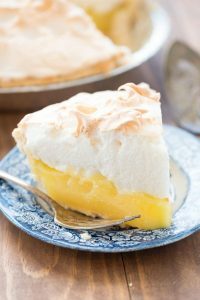 This year there is a ‘lemon surprise’ feel as the rear of the centre and wall by the kitchen are painted in that colour. In order to celebrate the start of the new year and Community Together CIC’s 5 Star Food Hygiene rating and newly decorated Hub, on a Monday and a Friday they are giving away free Lemon Cake with every hot drink purchased. 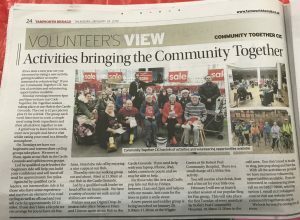 Community Together CIC continues to help people in Tamworth and surrounding areas to Grow Well, Live Well and Age Well through a variety of activities ranging from parent and toddler groups, youth groups to befriending services, walking group, cycling group and employment support. Our outreach work at Sir Robert Peel Community Hospital continues to be well supported with us offering Cuppa and a Chat on a Monday between 10am and 1pm. 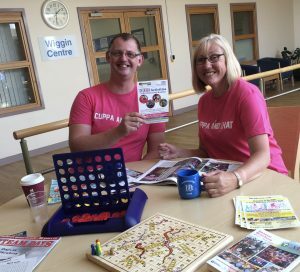 Our volunteers are on hand to have a chat with you over a free cuppa, or play a table top game such as draughts, chess, connect four or read a magazine together. This is perfect if you are feeling lonely and just want a friendly face to chat to. Pop down for half an hour, an hour, or longer we will be only to pleased to see you. We would like to thank Smyths for donating to us the table top games. On a Tuesday at 1pm until 2pm why not come for a walk with us. The walk is about two miles, going at a leisurely pace. A great way to get back into exercise or help improve your physical strength and to meet new people. On Wednesday our IT tutor Pete is on hand to help you with any IT issues you may have. This could be creating and email account, access services online, downloading photos from your phone, help using your tablet etc. Drop in between 11am and 2pm and have a chat to Pete to see if he can help. Thursdays Chair Based Exercise session runs from 10am until 11am. This popular activity is for all ages. Another opportunity for you to get back into light exercise, improve your physical strength, keep your joints supple and again another way to meet new people and make new friends. Over the coming months we will also be launching a new session of our Sing for Fun at Sir Robert Peel. This is an opportunity for anyone to come along and have a sign and a bit of fun. This is open to anyone and you don’t have to be able to sing. Our Hub in the Castle Grounds will soon be looking all festive as we look forward to the Christmas Lights switch on. If you are wondering what to buy people for Christmas, we have a fantastic range of pottery available for you to choose from and paint a personalised gift. You don’t have to be artistic to give it a go. Items are ready for collection 7 days after you have painted them. We will also be offering you some free gifts when you paint selected pieces of pottery. Paint a Shoe Wine holder and receive a free bottle of wine, a tea pot and receive a free box of tea bags and a large flower vase receive a free bunch of flowers. Items are limited while stocks last. We also have a number of Christmas decorations to paint from hanging decorations to baubles and mugs. 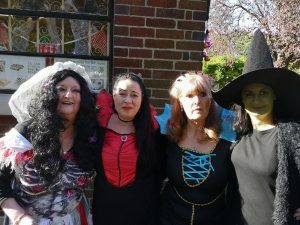 Prices range from £5 to £18 all monies raised go directly into supporting the community work of Community Together CIC. 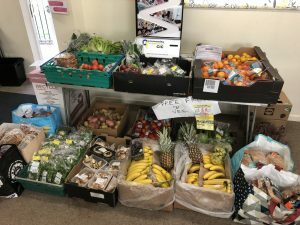 Community Together CIC also have weekly food donations made up of fresh produce Fruit and Vegetables which is available for people in the community to take. Simply pop in during opening times to see what’s available. Pupils engaged, learned and showed community Spirit as part of the event as they learned Firework Night Safety messages, healthy eating and exercise as well as creating a ‘Our Community’ art work featuring all the favourite things pupils enjoy about their community. Community Together CIC provided Firework Night Safety Pictures with safety messages which was talked through with pupils as well as a Safety Video put together by Year Two Pupils. 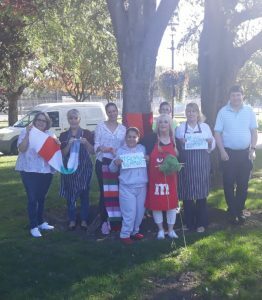 Everyone’s Health delivered a Healthy Eating and Healthy Exercise Session and St Peters Church provided Painting, Crafts, Soft Play and Art Materials to enable pupils to complete a piece of Art called ‘Our Community’. Two Rivers High School served refreshment and also brought along their Social Enterprise Stall. Local neighbourhood police were also in attendance. 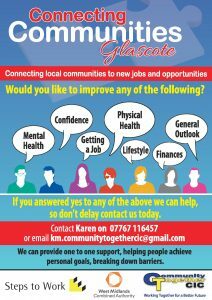 Glascote Locality Group is made up of local community organisations and stakeholders including local neighbourhood police, community centres, local schools who meet to discuss opportunities of working together and networking together. 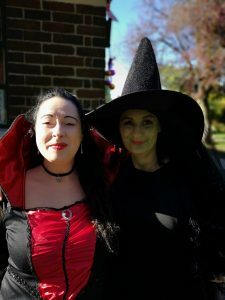 The group delivered a day in August providing a Free Community BBQ and this latest event saw free jacket potatoes being provided, future events will provide themed activities for all to enjoy. On Saturday 24th November 2018 we will be assisting the Herald at their open day to celebrate 150 years of the Tamworth Herald at the Town Hall between 11am and 2pm. Meet some of the team, look at past newspapers, enjoy a free tea or coffee and slice of birthday cake, have a go on the tombola or get artistic and help create a Birthday Mosaic that when completed will be presented to the Herald Team. We will also be helping support St Editha’s Church by entering a tree again in this year’s Christmas Tree Festival which takes place from Friday, November 23 to Friday, November 30 between 9am and 5pm. Members of the public can buy a token and vote for their favourite tree. The winners of each category are announced at the end of the Festival. Support the Church and buy a ticket and support Community Together CIC by voting for us. Thank you to all our Volunteers, visitors, service users, partners, funders and businesses such as Tamworth Heat Treatment (THT) for your support. For more information on Volunteering or any of the projects we deliver please see our website www.communitytogethercic.org.uk or call 01827 59646. 260 Pupils from Glascote Academy Primary School and 80 Students from Two Rivers High School attended an engagement day organised through Glascotes Locality Group coordinated by Community Together CIC through their Connecting Communities Glascote Project. 340 Pupils engaged, learned and showed community Spirit as part of the event as they learned Firework Night Safety messages, healthy eating and exercise as well as creating a ‘Our Community’ art work featuring all the favourite things students enjoy about their community. Community Together CIC provided Firework Night Safety Pictures with safety messages which was talked through with pupils as well as a Safety Video put together by Year Two Pupils. Everyone’s Health delivered a Healthy Eating and Healthy Exercise Session and St Peters Church provided Painting, Crafts, Soft Play and Art Materials to enable pupils to complete a piece of Art called ‘Our Community’. Local neighbourhood police were also in attendance. Glascote Locality Group is made up of local community organisations and stakeholders including local neighbourhood police, community centres, local schools who meet to discuss opportunities working together and network together. 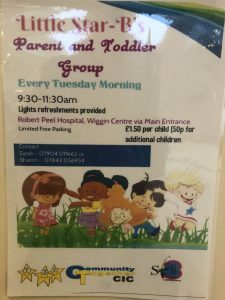 The group delivered a day in August providing a Free Community BBQ and this latest event saw Free Jacket Potatoes being provided, future events will provided themed activities for all to enjoy. 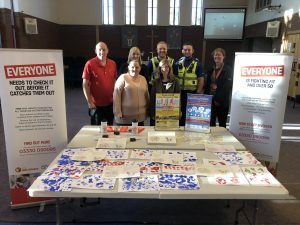 The Locality Group and Engagement event has been coordinated by Community Together CIC as part of their Connecting Communities Glascote project as a delivery partner with Steps to Work and commissioned through the West Midlands Combined Authority. 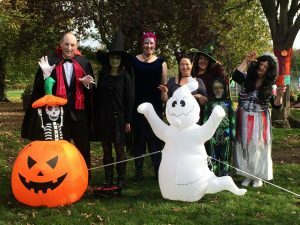 Spooky activities will be in full flow from Community Together CIC ‘Hub’ In Tamworth Castle Grounds at the activity centre, old Swimming Baths B79 7ND during Half Term Week. The centre will be open 7 days a week over the half term from 10am to 4pm and open the weekend of Saturday 27th and Sunday 28th October 2018 again 10am to 4pm. People can also pick up the ‘No Trick or Treat’ Leaflets for their Windows for those who don’t want unwanted callers on Halloween Night as well Bonfire Night Firework Safety Leaflets. No need to book just drop in during opening times. 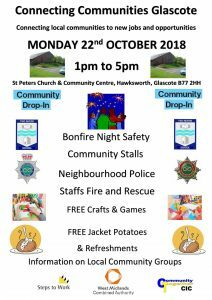 Bonfire and Halloween Safety messages are the theme of the latest Glascote Engagement Day being held on Monday 22nd October 2018 between 1pm to 5pm at St Peters Community Centre, Hawksworth, Glascote B77 2HH. 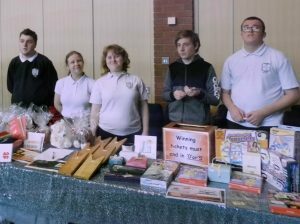 A great opportunity to meet your local neighbourhood policing team, Staffordshire Fire and Rescue Volunteers and see community stalls such as Two Rivers High School Enterprise Students. There will be FREE Jacket Potatoes and Refreshments plus FREE Children’s Crafts and Games. This is the 2nd Engagement Day organised through the ‘Connecting Communities’ project commissioned via the West Midlands Combined Authority and delivered by Community Together CIC in partnership with Steps to Work. Flourishing community interest company Community Together CIC is launching a brand-new cycle festival in Tamworth this summer. Tamworth Cycle Festival will take place throughout the Castle Grounds on Saturday, June 30. The free event will include a fun, friendly two-mile cycle and 30-mile challenge organised by British Cycle. Other activities and attractions will include stalls, bike security, safety and maintenance, ‘have-a-go’ BMX and mountain bikes, children’s crafts, live music, a wheelie competition, the chance to win a £200 bike in the festival raffle and a visit from the Staffordshire Bike Bus. Community Together CIC project lead Lee Bates said: “We’re very excited to bring the Cycle Festival to Tamworth. There will be something for everyone on the day from beginners to advanced riders. 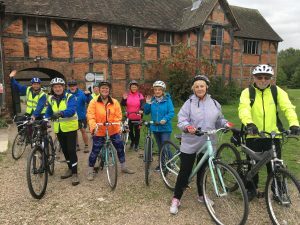 “There is a lot of cycling activity across Tamworth and we wanted to bring those partners together to make the community aware of what’s on offer and how to get involved. Tamworth Cycle Festival is being organised in partnership with British Cycling, Tamworth BMX Club, Tamworth Mountain Bike Club, Tamworth Cycling Club, Dave Owen Cycles, 2 Wheels Only, Tamworth Borough Council, Staffordshire County Council and Staffordshire Police. Festival-goers will be able to take part in the two-mile cycle, which will run throughout the day and will be marshalled by Tamworth Sea Cadets. Participants will be able to join the ride at any point with no registration required. 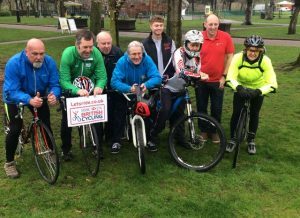 British Cycling’s 30-mile challenge will see cyclist ride from Tamworth Castle Grounds to Whittington Barracks, past Wilnecote’s 2 Wheels Only cycle shop and back into the town centre. 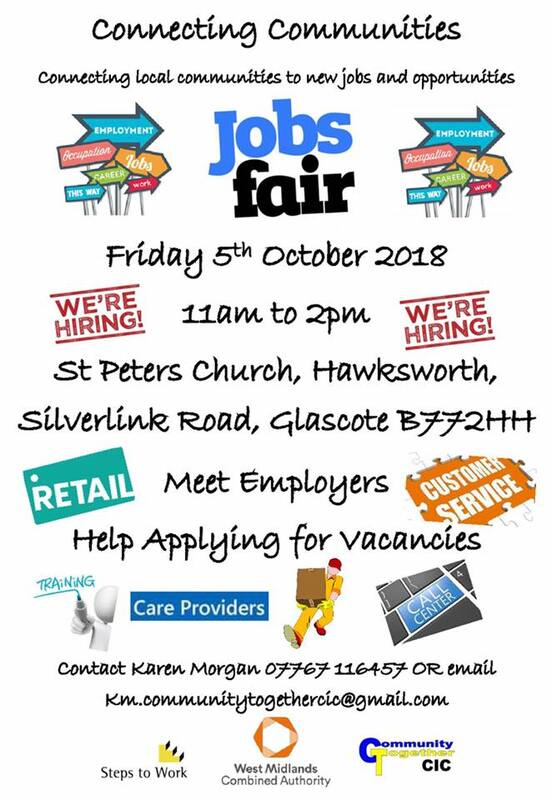 Activities will take place in and around Community Together CIC’s Activity Centre, based at the former Tamworth Swimming Baths site at 2 River Drive in the Castle Grounds, opposite the Tennis Courts. Dave Owen cycles will be on hand on the day offering bike maintenance workshops and has donated a bike worth £200 for the raffle draw. Jonny Paul, assistance manager at Dave Owen Cycles, said: “We’ve been here in the Castle Grounds for more than seven years and we’ve tried to help the community out as much as possible in that time so it’s nice to see different businesses and community groups involved in cycling come together for this festival. To celebrate that we are donating a bike up to the value of £200. Tamworth specialist cycle shop 2 Wheels Only is sponsoring the festival’s Wheelie Competition, which will begin at 1pm and offers competitors the chance to win cycling goodies. 2 Wheels Only company director Nik Wood said: “It’s great that everybody involved in cycling in Tamworth is coming together for the festival to encourage people to try cycling, ride more or get back on a bike if they haven’t been able to for some time. Tamworth Cycle Festival will take place on Saturday, June 30 from 11am to 4pm in the Castle Grounds. For more information about the event call Community Together CIC on 01827 59646 or email ctcicinfo@gmail.com. Growing community interest group Tamworth Community Together CIC will attempt to set the record for the world’s biggest oatcake in celebration of Staffordshire Day on Tuesday, May 1. Volunteers will bake the county favourite when the group hosts a community event in the Castle Grounds from 10am to 3pm. The current known record stands at 24 inches in diameter, with Community Together CIC hoping to create an oatcake of at least 30 inches. “It’s the third consecutive Staffordshire Day on Tuesday, May 1 when people across the county are encouraged to promote all things Staffordshire and their area,” explained Steve Hodgetts, Community Together CIC director. 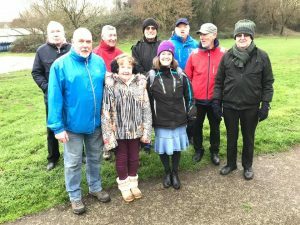 “The idea is for villages, towns and cities to encourage people to visit other places in Staffordshire and vice-versa, and we’ve been invited to take part. “The oatcake is a famous Staffordshire bake and we want to make the world’s biggest. A couple in Fenton made an attempt a couple of years ago, but it wasn’t recognised by Guinness World Records. The guidelines say it that for a new campaign to be considered it has to be something people want to repeat. The Staffordshire oatcake is a savoury pancake made from oatmeal, flour and yeast. Its origins date as far back as the Middle Ages. It was popularised during the 18th century when the oatcake was the staple diet of the potteries folks. As well as the record attempt, Community Together CIC is hosting a range of free fun-filled activities including a ‘make your own’ Staffordshire oatcake, children’s crafts and a Staffordshire quiz. Also on offer all day will be half-price pottery painting. After the oatcake has been baked and enough evidence has been gathered to submit the record attempt, the savoury pancake will be cut and enjoyed with afternoon tea. Community Together CIC’s Guinness World Record attempt will take place on May 1 in the Activity Centre at the former Tamworth Swimming Baths site at 2 River Drive in the Castle Grounds, opposite the Tennis Courts. For more information about the event, Community Together CIC sessions, workshops and volunteer opportunities, call 01827 59646 or email ctcicinfo@gmail.com.